There are many ways that colors can affect our mood, perception, and even our decisions. However, an average Internet user rarely pays attention to the influences of colors on their decisions, most people do not even notice it. The most skilled of web designers learn how to manipulate the brain’s natural recognition and perception of color to the company’s or website’s advantage. With a limitless amount of colors and color combinations, a web designer’s skills are something that has to be honed and improved over time. Depending on your target audience and the type of user activity, the color theme can change drastically. After all, it is no coincidence that the top 3 most popular social networking sites, Facebook, Twitter, LinkedIn, rely heavily on a blue and white color scheme. In this article, we will be looking at some of the basic elements of color psychology and web design. Please note that color psychology can vary drastically around the world, for this article we will be using color theory often associated with the Western culture. On the color wheel, every color has an opposing color that gives it contrast. 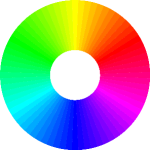 For example, if we look at the color wheel on the right, we can see that the opposing color of yellow is blue. Does that remind you of any company? Ikea springs to mind almost instantly. Contrast is an essential aspect of color theory to consider when thinking about website design. complementary colors and are often used in website design to help the colors “pop.” The new Google logo is a perfect embodiment of a complementary color scheme done well. It is actually reminiscent of a minimalistic color wheel. The red complements the yellow. The yellow complements the green; and the green complements the blue. Vibrancy is more than just about flash. It can have tremendous consequences on how users interact with your website. Any web designer’s aim is to harness the power of color psychology and use it to create an appropriate setting for their website. Cool colors (ex. green, purple, and blue) tend to be more relaxing and tranquil. These colors are perfect for social media sites because the user is inclined to stay longer on the website as compared to a warmer color palate. Speaking of which, warm colors are more energetic and give off a more alert, “right now” vibe, making them perfect for breaking news and dating sites. While using the minimalistic black and white dashboard, they have also implemented a complementary color scheme for their tabs. Although a regular reader might not notice the subtle effects, it can be easily be demonstrated by showing the same style, but this time without the additional menu colors. See what a big difference those little color lines can make! Let’s look at some of the most popular colors in web design today and how they can be interpreted by the users. Red is often described as the most visually stimulating color. It represents passion, power, love, anger, heat, and a whole lot more. If you are trying to capture the user’s attention quickly, red is the color of choice. However, some recommend to use red in your website design sparingly since where you place the most red will be where the user’s eyes navigate to first. Therefore, you would want to put your call to action, or your main message, in red or surrounded by red; using too much red can cause the eyes to wonder and the message to be lost. Between yellow and red, there lies the sweet, warm color orange. This color is both energizing and pleasing to the eye. Orange is often associated with a new, fresh, or hip. As a secondary color in a color scheme, it is perfect for a call to action. Just check out how Vivint, a “smart” security company, directs the attention towards the “Free Installation” button. A person browsing this website, would most likely see “Free Installation” first and then proceed to read about the service; this is an excellent example of the use of web design to complement marketing efforts. Black appears to be the new go-to color for web design. It is perceived as a very minimalistic color and as such has an aura of elegance, sophistication, and even strength. One of the best things about black is that it can used with almost any other color and still make a perfect match. The queen of all simplicity in web design is white. Generally, white represents peace, innocence, and purity. In this technological age it also represents cutting edge technology. Both formal and neutral, gray is among the most versatile colors in web design. If used correctly, a little bit of gray can add just the right hint of sophistication to your website without coming on too hard. In addition, gray can be used with almost any color scheme to enhance the contrast of your colors. While this color knowledge can often be brooding, it is essential for any web designer to understand the basics of color psychology. From the information above, we can comfortably conclude that colors can carry a lot of weight in web design. While it might seem like you can’t go wrong with any one color scheme, the effects of such changes will propagate through your website and directly affect the user experience.